Peach season is nearly done. 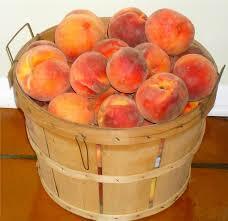 I have enjoyed excellent cobbler, spectacular peach crumb pie, tasty peach muffins and lots of sliced peaches on cereal or just whole peaches Au natural: the peach fuzz is full of fiber! One more good peach recipe for you: one with no cooking. A recipe for a company dessert with next to no work, that sounds about perfect for my busy life. Your success depends on the quality of the three ingredients. Yes, just three so they better be the best you can find! I like peaches direct from the orchard, the best quality raspberry jam you can afford (homemade jam is the bomb for this recipe!) and excellent vanilla ice cream; I prefer Turkey Hill handmade vanilla. This post is all about none other than Peach Melba, created by that world renown chef Escoffier in honor of an Australian opera singer, Nellie Melba back in the early 1890’s. If you look it up on line you can find fancy versions in stemmed glassware using a whole peach. It is old school but truthfully the classics never go out of style. The flavors are just perfect together with next to no effort on your part. 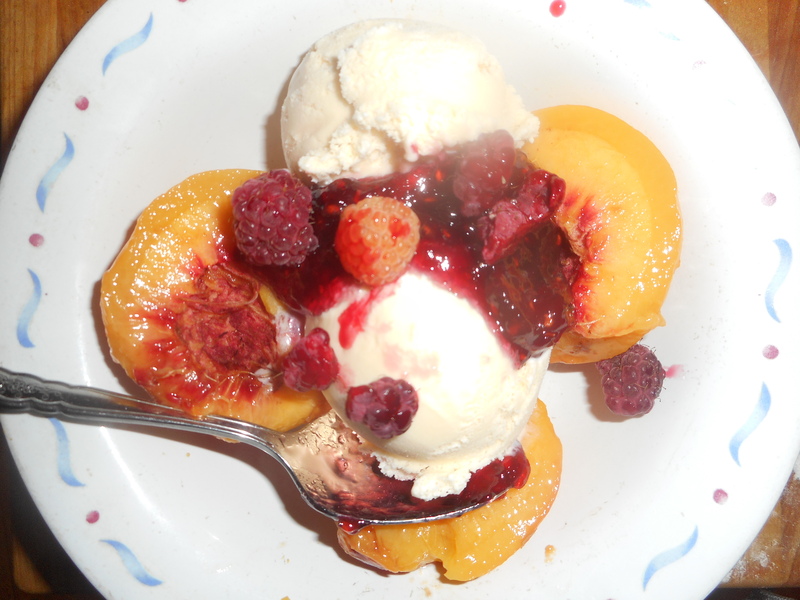 My typical version of peach melba is very rustic; in a desert bowl, no stemmed glasses like above, no six dollar a pint ice cream but delightful. A friend of mine wanted something special for company dessert, no baking, no gluten and fruit based. I gave her this recipe and it was a huge hit. Even a non-cook can put this beauty together in less then 10 minutes. Heat a pot of water deep enough to immerse your peaches, bring it to a boil. Gently drop in the peaches, turn heat down to medium and simmer for 3 minutes, remove with a slotted spoon. Cool enough to be able to peel. Peel the fruit, cut in half and remove the pit. Place the peach halves in a dessert cup. 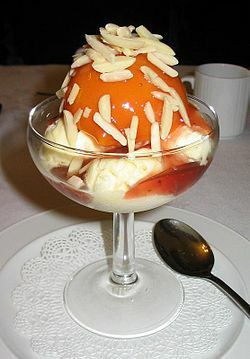 Top with 1-2 scoops of high quality vanilla ice cream and then drizzle the raspberry jam over the peaches and ice cream. That’s all there is to Peach Melba. Takes like 5 minutes to put together. 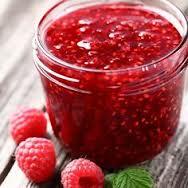 I sprinkled some fresh raspberries, red and gold ones on my serving. You can guild the lily with slivers of almonds but I prefer it with no further additions. The peaches and raspberries play off each other perfectly and the vanilla ice cream is the ideal base for them to be showcased with. Enjoy this naturally gluten free treat before all the good peaches are gone.